The 10 Best Smoothie Places in West Virginia! The growing desire for healthy living has provided a platform for a delicious favorite drink—the smoothie. Smoothies combine fruits, veggies, seeds, nuts, herbs, and other healthy ingredients into a flavorful and vitamin-packed drink. Here are the 10 best places to grab a refreshing smoothie in West Virginia! Milk might do a body good, but juice fuels your body for the rest of the day, especially if you stop at Raw & Juicy Juice Bar in Fayetteville, West Virginia. 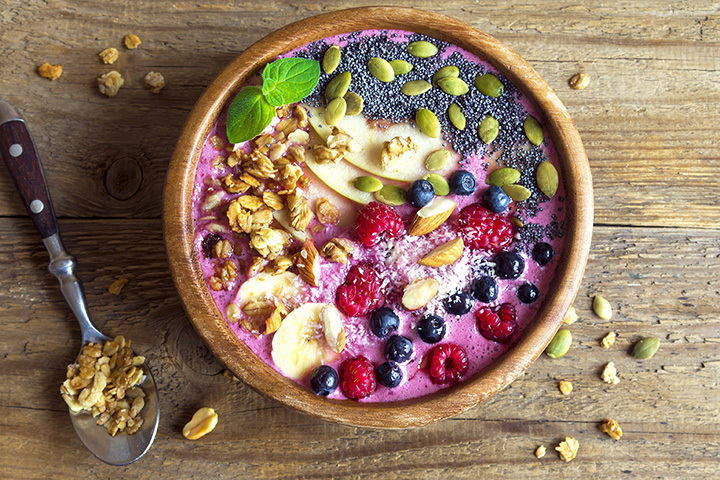 Offering fresh juices, delicious smoothies, and a great selection of vegan and healthy treats, you can also try a celebration of the smoothie—the smoothie bowl! Filled with your favorite smoothie, oats, fresh fruits, coconut, nuts, and seeds, you’ll wonder how you lived without them. They say love and marriage go together, but have you ever tried drinks and art? You can, if you stop by Lostdogcoffee Fine Arts Drink Emporium in Shepherdstown, West Virginia. This quirky little coffee shop specializes in coffee, cappuccino, espresso, tea, juice, smoothies, and cookies in a relaxed, but dangerous atmosphere. Dangerous because they promise to destroy your previous conceptions about what a coffee shop is. Stop by any day of the week and get your drink on. Located in Vienna, West Virginia, near the Ohio River, Serenity Coffee House serves breakfast, lunch, and dinner with your choice of coffees, smoothies, and healthy drinks and desserts. Hot or iced beverages can have expresso shots, whipped cream, or soy milk if you prefer, and they have meal replacement smoothies in flavors like banana, peach, cotton candy, chocolate frosty, and orange creamsicle. Have one of their tasty biscottis or brownies with your favorite drink any day except Sunday. With a focus on great coffee and community, the Wild Bean has been serving folks in the Lewisburg, West Virginia, area since 2006. You’ll know this is some place special as soon as you walk through the front door and literally smell the coffee. Using fair-trade organic, and healthy coffees, teas, fruit smoothies, lattes, and baked goods, they offer breakfast and lunch with a flair. Drink flavors include frosted mint, amaretto, banana, mango, and at least 30 other delicious choices. This is a great choice for meat-lovers, vegetarians, and vegans. Open every day. Gourmet coffees, teas, smoothies, milkshakes, beers, and a great selection of baked goods for breakfast and lunch are what you’ll find at the Blue Moose Café in Morgantown, West Virginia. This quaint retro diner is the perfect place to come and sit a while. While you wait for your order, you can enjoy the local art on display or the live music. Hidden in the West Virginia hills near Hinton is a surprising little hidden gem of a coffee shop by the name of Chestnut Revival. Serving breakfast, lunch, and dinner, this little café has an amazing lineup of organic and free trade regular and decaf coffees served hot or iced. They also offer over 27 teas like Passion Fruit Jasmine, White Peach Peony, and blooming teas, delicious two-flavor smoothies and protein shakes made from all natural ingredients, and a wide variety of baked goods. They’re open every day and have live events on weekends like Open Mic Night, Storytelling, and live music. The Smoothie Stop can’t be missed. The bright colors like pineapple yellow, citrus orange, leafy green, and apple red are everywhere and reflective of the great smoothies and protein drinks available there. Over 18 different smoothie flavors are featured and served up to enhance physical performance, boost energy, increase nutrition, and improve overall health. Protein bars can be purchased and hot soup is available in the winter months. Even though there I Love Juice Bars in other states, the one located at WVU in Morgantown, West Virginia, is the only one in the Mountain State. Serving amazing plant-based cleansing juices, smoothies, essential oil, power, and monster shots, and fruit and grain bowls using 100% fresh ingredients made in-house, you’ll love this juice bar. Are you looking for a great way to start your day? Stop by the Appalachian Coffee House in Mount Nebo, West Virginia, for your favorite hot or iced coffee treat or other specialty drink. You’ll not only get great smoothies and teas, but service with a smile. These reasonably priced drinks not only taste good, they’re good for you!